Date: See calendar for the next scheduled course. Cost: $450 (Range fee, pistol and ammunition not included). Payment: Please click on "Buy Now" button below. Note: The address above is for the first part of the course (theory). The practical part (i.e. shooting range), takes place at AA Lock&Gun range in Ft. Lauderdale (exact address below). Please bring 100 rounds of ammo and your pistol. You can also rent a pistol and buy ammo at the range. 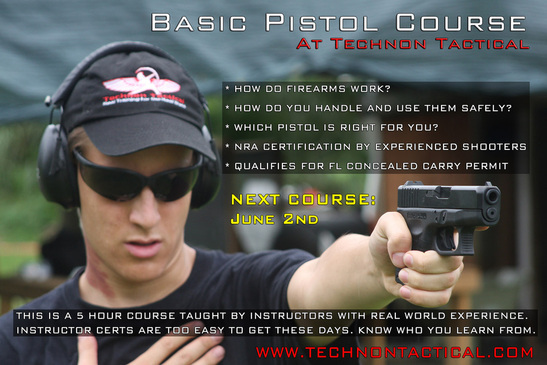 This course includes classroom and range time learning to shoot revolvers and semi-automatic pistols. Students learn NRA’s rules for safe gun handling; pistol parts and operation; ammunition; shooting fundamentals; range rules; shooting from two handed and one handed standing positions; cleaning the pistol; and continued opportunities for skill development. Students will receive the NRA Guide to the Basics of Pistol Shooting handbook, NRA Gun Safety Rules brochure, Winchester/NRA Marksmanship Qualification booklet, take a Basics of Pistol Shooting Student Examination, and course completion certificate. Go to NRA Courses Page.